Two weeks ago, we asked the Spiceworks community to answer the question “Why did you chose to be a Sysadmin?” We are blown away by the number of stories we’ve received from you. Thanks to everyone who took part in the contest. Have passion for IT (33%) – Was your PC your best friend when you were a child? There’s nothing to be ashamed of! Just turn it into your career and get paid. That’s exactly what one third of Sysadmins did. Enjoy helping people (27%) – Some people with a high level of empathy apply for Peace Corps, the rest become Sysadmins. Day after day, you guys inspire end-users to press the reset button themselves (Spiceworks user Mike L), bring order to their chaotic PC world (Spiceworks user Nadia), and cover their backs when they have no clue what they are doing. Aren’t you superheroes? Can’t make money from my other skills (12%) – Sysadmins are naturally talented guys. So, there is no surprise that before entering the IT world some of you tried to earn money stripping (Spiceworks user John Sly), playing the guitar (Spiceworks user Brian Packard), or doing construction work in the summer heat (Spiceworks user Jeff Anderson). But one day, you took a position that came with big earnings and a luxury life. Nice choice! Want to control the world and dominate (12%) – Who wouldn’t like to control this world? Sysadmins believe they’re the best ones to make this happen. Running the world and printers is the best combo ever. Rely on destiny (7%) – Some of you guys just can’t explain how all this happened to you. Magic, destiny, absence of other options, or a boss told you that you are a Sysadmin from now on. Either way, you did what you had to do. Fame and glory (5%) – Vanity is the most common Sysadmin’s sin, isn’t it? Crowds of thankful users that nickname you a hero after the latest fix of their printer jam and @Power2ITGuyz publishing your tweets — all these glories make even Justin Bieber jealous. This is the world every Sysadmin lives in. Enjoy pain (4%) – It’s ok to admit that you love pain and punishment. These two are the integral parts of a Sysadmin’s life. The key to success is a high-quality painkiller. 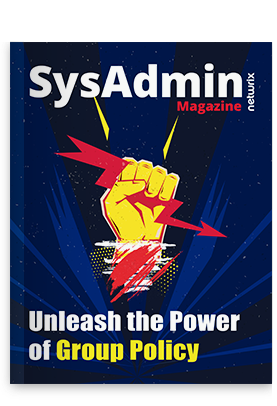 For instance, Netwrix provides Sysadmins who have regular aches from protecting sensitive data and helping helpless end-users with a bunch of free Sysadmin tools that turns their everyday hell into an IT heaven. Let everyone know your reason for becoming a Sysadmin! Choose one of the answers below or submit your thoughts in the comments. Why did you choose to be a Sysadmin?